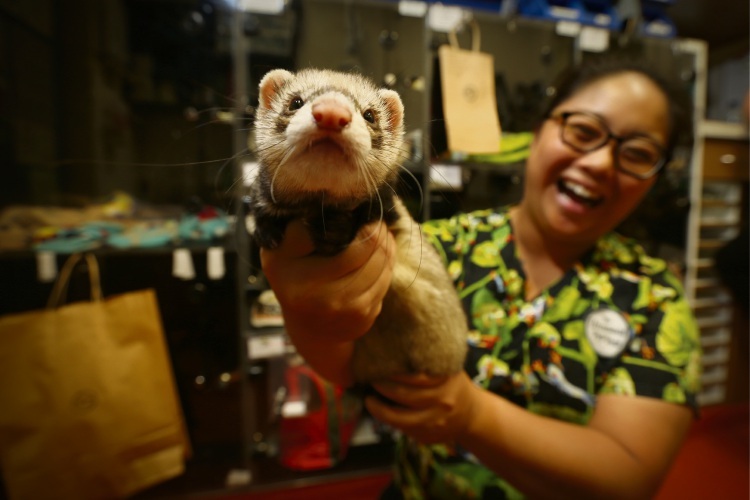 Dr Nicole Su with a ferret at the Unusual Pet Vets at Murdoch University. DID you hear the one about the snake that swallowed the shoe or the axolotl that has not been eating at all? While they might sound like setups to a punch-line, they are in fact situations the team at The Unusual Pet Vets encounter on a regular basis. Nicole Su said the exotics-only practice based at Murdoch University saw a wide variety of animals; from snakes, bunnies and ferrets to bearded dragons, frogs and even backyard chickens. But not your traditional cats and dogs. Dr Su, who has worked at the clinic for four years, said the majority of animals attended to are family pets, although they also care for wildlife brought to the hospital as well. “Every species is very different so for example the medications you can use, the procedures that you can do, the anatomy – everything is wildly different sometimes from consultation to consultation,” she said. She said there was a fresh story to tell every day. “You might have heard of the snake that swallowed a shoe… so we do see that all the time – not shoes but sometimes rocks and other silly things,” she said. “Today I removed a growth on a little pigeon’s eye and stitched up a wound. She said the role offered her the chance to come face to face with some of the rarest animals in the state, including “an interesting mutation of a death adder”. “That’s definitely not one I’ve seen before,” she said. “There’s reptiles brought in to WA and we sometimes get the first look at them as well.